By using a combination of an external hot tub heat exchanger and electronically controlled diverter valve or pump with the Balboa digital spa pack, you can now use any external heat source of your choice. Efficient boiler systems and solar heating are some of the most popular choices. 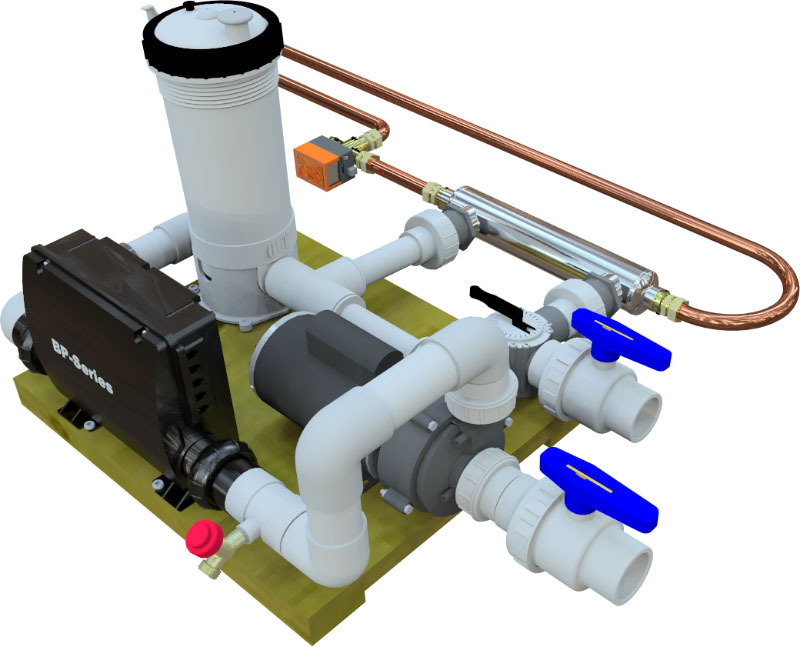 Our engineers have created a universal heat exchange heating system that works by controlling the flow of heat transfer fluid (usually a glycol based mixture) through a heat exchanger when heat demand of the hot tub is needed. Once the hot tub reaches the programed operating temperature, the diverter valve (or pump) is then closed until demand is needed again. This is all controlled in the same manner as an en electric hot tub element. However instead of energizing the element, the system energizes a zone valve or pump to transfer heating fluid into the heat exchanger. 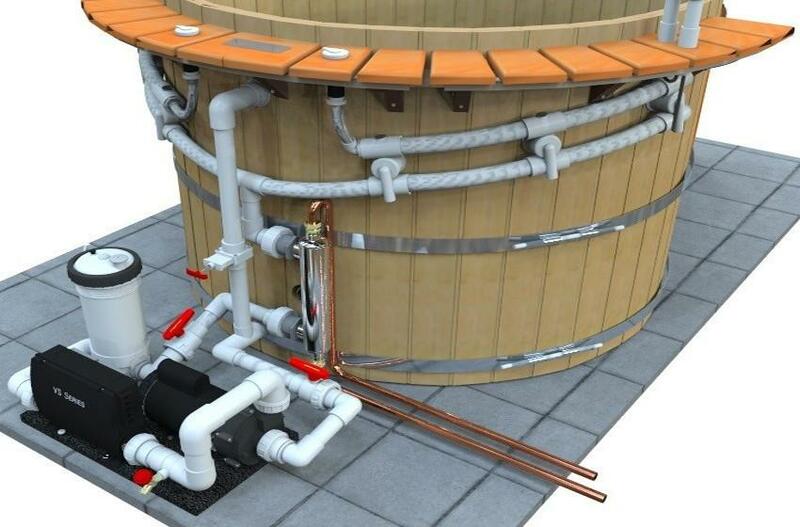 This system can be added to any of our hot tubs including our Ofuro soaking tubs. The system can be installed as a retrofit or a new installation. 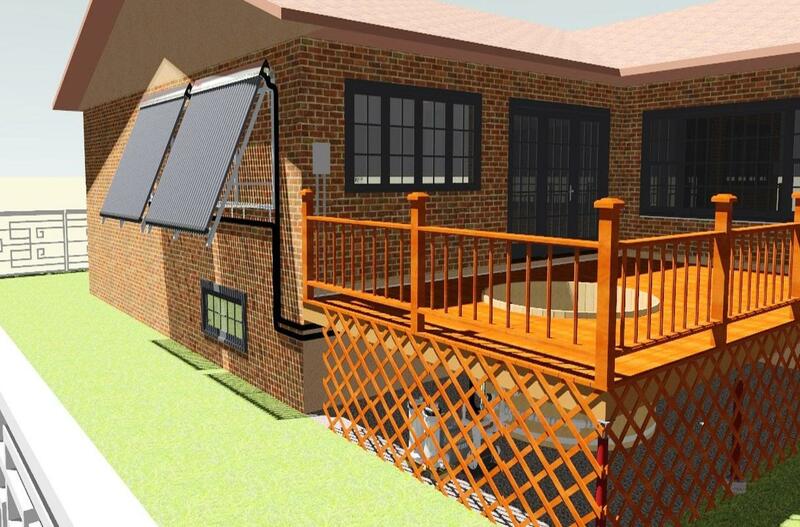 This system deploys a heat exchanger to transfer heat from a residential hot water heating system to the hot tub. The arrangement of the jets and the skimmer and suction(s) is the same as for electric-only heated tubs, (Figure 29 for example). The hot water system can be a conventional gas heat boiler (hydronic heating) or it could be thermal solar hot water storage tank (solar thermal heating). The heat exchanger system is conceptually similar the the hybrid gas/electric system, except instead of using a gas heater as the “auxiliary” heater, the heat exchanger is used. From the residental boiler heating perspective, the hot tub is treated just as another heating zone. We supply a 3-way zone control valve, to control when the hot water will flow through the heat exchanger and we supply a modified spa pack so it can control this zone control valve. When heat is called for this zone valve is opened by the spa pack. 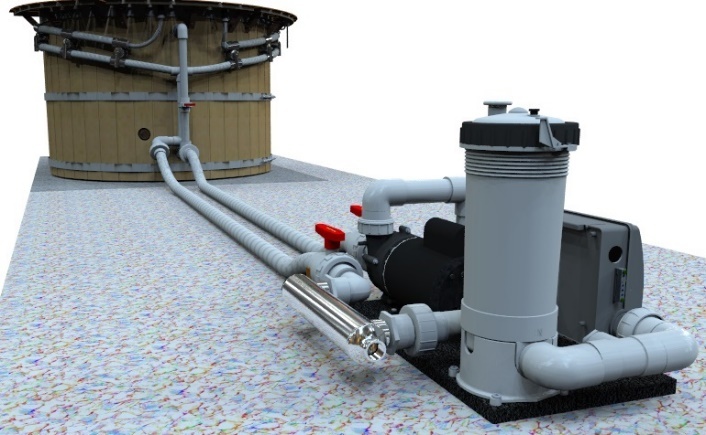 The heat exchanger is installed in the piping leading to the jets, either at the tub as shown next, or if the skid pad is remote, it can be installed with the skid pad. If the boiler system is an oddball, instead of a zone control valve, it may require a circulation pump to circulate the hot water through the primary of the heat exchanger. In that case the spa pack still provides the 120 volts to turn the pump on and off inresponse to heat demand for the hot tub. Instead of a position that is part of the zone control valve, we supply a normally open contact directly from the spa pack. It will act as the zone thermostat if the boiler needs it. If the installation is in a freezing winter climate, then care needs to be taken that the water coming to/from the boiler will not freeze. Either an intermediary heat exchanger and pump is added added so polypropolyne glycol can be used, or the skid pad and heat exchanger has to be located in a heated space. If the latter is used, an auxiliary freeze sensor is then added to ensure the external (outside) pipes will not freeze. 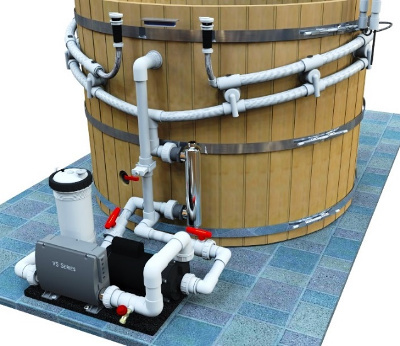 The heat exchanger is installed in the piping leading to the jets, either at the tub as shown, or if the skid pad is remote, it can be installed away from the tub with the skid pad. The boiler may require futher control logic with its circulation pump to circulate the hot water through the primary side of the heat exchanger when the zone valve is open. If the installation is in a freezing winter climate, then care needs to be taken that the water coming to/from the boiler will not freeze. Either polypropolyne glycol is needed in the boiler loop, or the skid pad and heat exchanger has to be located in a heated space. If the latter is used, an auxiliary freeze sensor is then added to ensure the external (outside) pipes will not freeze.